One Per Case: Book Release Party This Weekend! Giveaways Galore!! Book Release Party This Weekend! Giveaways Galore!! If you're in the Sacramento area this weekend, OPC recommends an excellent event that you should not miss. Click on the jump to learn more. OPC is always looking to support local artists and superfans of anything nerdy, geeky, or just plain awesome. 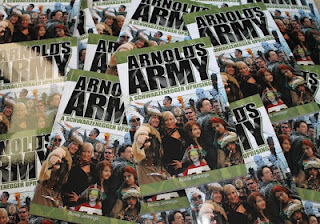 This weekend is no exception as our good friend Randy Jennings from TheArnoldFans is releasing his first book! Titled Arnold's Army: A Schwarzenegger Uprising, it tells of Randy's experiences in the World of Arnold, sharing stories about his 40 meetings with the actor over the past 20 years. His book will be officially released that evening, and you can grab a copy at the release party. To celebrate the release of a new Roseville restaurant and the new book, a FREE Schwarzenegger party will held at Sports Page Restaurant and Bar (1595 Eureka Road, Roseville, CA 95661). Our boy SandwichJohn will be there to hand out prizes and screening passes, while Arnold films play on the televisions. John will be handing out screening passes to Pitch Perfect, Taken 2, and Looper (to the first 50 people). He will also have DVD giveaways and a few other surprises! The fun begins at 6pm and is for adults only. Don't worry if you're under 21, as you'll still have a chance to get your hands on the screening tickets. Here's more detailed info about the book - we hope you will support Randy by packing Sports Page! Barbarians, Commandos and Terminators come to celebrate the release of Arnold’s Army: A Schwarzenegger Uprising! Unlike every other Arnold book, which focused on just the movie star or the politician, Arnold’s Army: A Schwarzenegger Uprising, written by Randy Jennings, is about the ballsy fan base behind the man. Never before and never again will a Schwarzenegger book come along packed with as many big secret reveals, surprise testimonials, uncovered facts and loads of celebrity interviews and statements given by Arnold’s friends, family, neighbors, film-makers and co-stars. Within 20 chapters of the 185-page book, we will explore the everyday lives of an Arnold fan, discussing our fascination, tattoos, workouts, collections, cigars and ways in which we celebrate our hero. Listen to the tales of the most inspired fans, recall stories about Schwarzenegger’s restaurants, discuss how we’ve been dealing with his absence in films, examine the rise of his number-one fan site, determine who are the biggest fans, divulge film sites, and discuss the many possible future goals that we may soon see Arnold achieve. As the president of Arnold’s longest-running, biggest and best Arnold website in the world, Jennings has gotten to know some outstanding fans and celebrities, and this book will focus on our lifestyles, habits and hobbies that go into being such proud Schwarzenegger fans. Finding Arnold as a hero at the age of eleven and having his first encounter with the action star at age nineteen, Jennings has interacted with his Austrian mentor roughly 40 times on various functions including red carpet premieres, film sets, political rallies, Arnold Sports Festivals and restaurant run-ins. Book Specs: Paperback ($14.75) color PDF for eBooks ($7.00). Or BOTH for $17.00 (allows you to get started reading it now while the book is being shipped).Pages: 185Size: 6 x 9Release Date: September 22nd, 2012 or NOW for TheArnoldFans.com readers!ISBN: 978-0-9882535-0-6Where to purchase: www.ArnoldsArmy.com (Paypal), Amazon.com (credit cards), Mail: (check or money orders). ContactrandyTAFs@yahoo.com for snail mail shipping address).Preferred Payment Method: PaypalHandling Time for Paperbacks: No more than 3 days to get it to the post office.Handling Time for PDFs: Emailed to you within 1 to 9 hours.Shipping: $3.00 for USA Shipping.International rates: Canada: $6.50 or $10.00 in all other countries.